Avid reader, first time tipper. First I gotta say I love the blog – really great stuff. Indispensable if you live in GP. And congrats on the NY Mag article! I wanted to write you b/c my 2 bikes were stolen from the Viridian garage (110 Green Street) yesterday (I think). They were last seen on Thursday at 11:30pm and were gone this morning around noon. 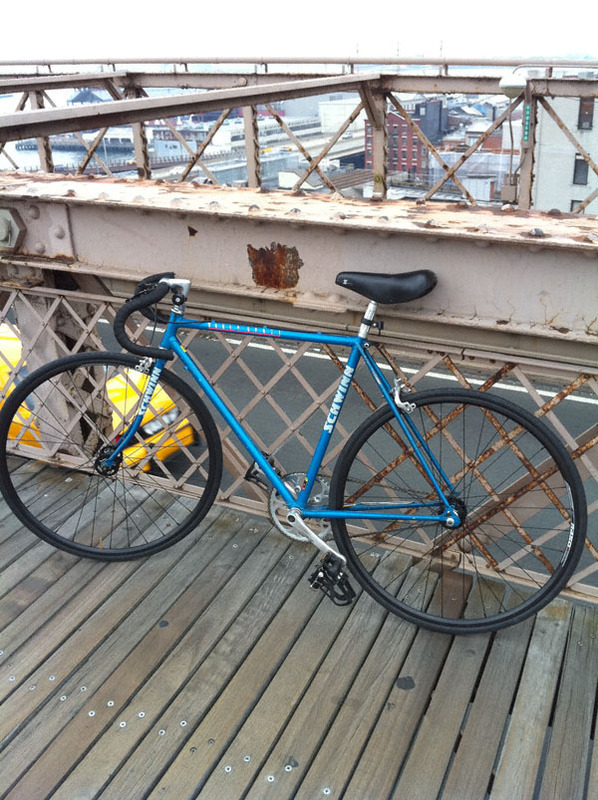 The 2 bikes were: 1) 1980’s Schwinn World Sport – blue frame with black handle bars, fixed and 2) 1980’s Windsor Carrera Sport – gray frame with red handlebars. I’m really bummed about them being stolen… Maybe you or one of your readers will see them around town. If you do please let me know! Thanks again and keep on rockin! First off, thanks for the incredibly nice words Michael. They are greatly appreciated! You might be interested to know I will be featured on L Magazine’s web site this upcoming week— so keep an eye out! Otherwise, if anyone has seen a bicycle fitting either of the above descriptions please contact Michael via email at: michael (dot) auerbach (at) gmail (dot) com. I got 1 back! Saw some dude with the Windsor on green. Said he found it on the end of Huron street and he gave I back to me! Still missing the Schwinn tho! I hope we can get it back!! !